Advocates of the environment and great outdoors could finally celebrate a victory over the Norwegian government on Monday, when Prime Minister Erna Solberg and Oil Minister Terje Søviknes announced they would protect a scenic waterway in the mountains of their home county of Hordaland in Western Norway. It’s called Øystesevassdraget, and it’s been the site of a hydroelectric battle for years. Now the scenic area that’s popular with hikers and nature lovers will be preserved. “This is a unique waterway, and one of the last untouched waterways that runs free from the mountains to the fjord,” Solberg said when announcing her government’s decision to reject applications from BKK Produksjon AS and Øystese Kraft AS to channel waters from the upper portions of Øystesevassdraget and develop the lower portions into a power plant. 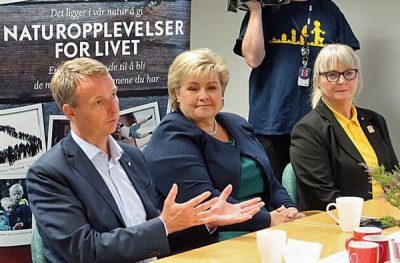 Søviknes, who represents the Progress Party and has been harshly criticized for his zeal to open up offshore areas for oil exploration, agreed with Solberg that Øystesevassdraget has “special qualities” that are important to protect. 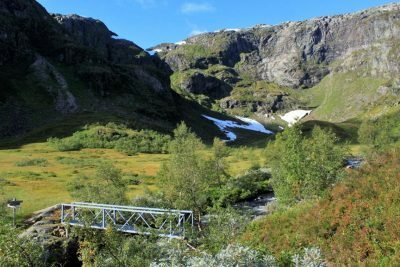 The wild upper portion of the river that feeds the waterway and its waterfalls is one of the few left in the mountains of Kvam (Kvamsfjella) that has been allowed to run freely. Solberg and Søviknes announced their preservation in the offices of the Norwegian mountain trekking organization DNT in Bergen, just two weeks before the parliamentary election. DNT, which has thousands of members nationwide, has been among the most ardent opponents of using the waterway to generate electricity, along with environmental and tourism organizations. NVE, Norway’s directorate of waterways and energy, had recommended allowing development of its power potential, not least since BKK had promised “careful” development. Solberg and Søviknes thus overruled the directorate’s professional advice, choosing to give in to regional political pressure to save the area from development instead. “It was good to clarify this issue before the election,” Solberg told local newspaper Bergens Tidende. The mayor of Kvam, Jostein Ljones from the Center Party, had found the development plans “acceptable,” but said he must accept the government’s decision. “Now we’ll just have to try to exploit the area for tourism,” Ljones said.